I got myself up nice and early today. Since I was up, I decided to get some packing done while Jessica continued sleeping. She sleeps a lot and she sleeps often. I pranced about the apartment and retrieved my belongings and made several organized piles on the floor. I then hauled my bags out and looked at how tiny they were. I was worried that all my possessions wouldn’t make it home with me. I hadn’t realized how much I had bought. I hadn’t really purchased anything too memorable, it was mostly food. Bags of peanuts and dozens of espresso pods, boxes of chocolate, bags of salt and the like. I had invested quite heavily in Monoprix’s J’♥ Ma Maison line of tableware, so I had to rummage about to get everything to fit. I cranked up the Eartha Kitt music and started rolling pants and stuffing espresso cups into scarves. I was terribly pleased when I was finished. My bags were heavy, but they were neatly packed and ready to go. I decided to have breakfast. 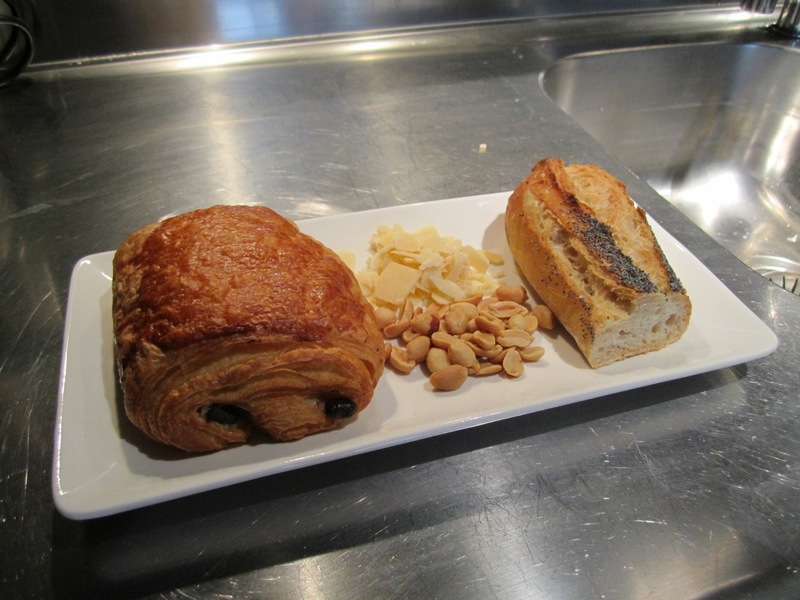 This is my perfect breakfast: pain au chocolat, grilled peanuts, parmigiano-reggiano, and a wedge of poppy seed baguette. HEAVEN! Especially when paired with some lovely pineapple juice. It was raining outside, the sky as grey as slate and I was terribly uninspired so we decided to just stay in–maybe head to the grocery store later. The rest of the day passed slowly in a rather relaxing way. Once dinner time came round, we went down to Monoprix and bought some soup and ravioli as always. We also grabbed a bottle of wine because we wanted to get drunk. Jessica headed home and I snuck over to Miss Manon. It was terribly depressing to go in. I knew that I would miss it so desperately. Inside, there was a flurry of activity as always, the short old woman winked at me and hurried about. 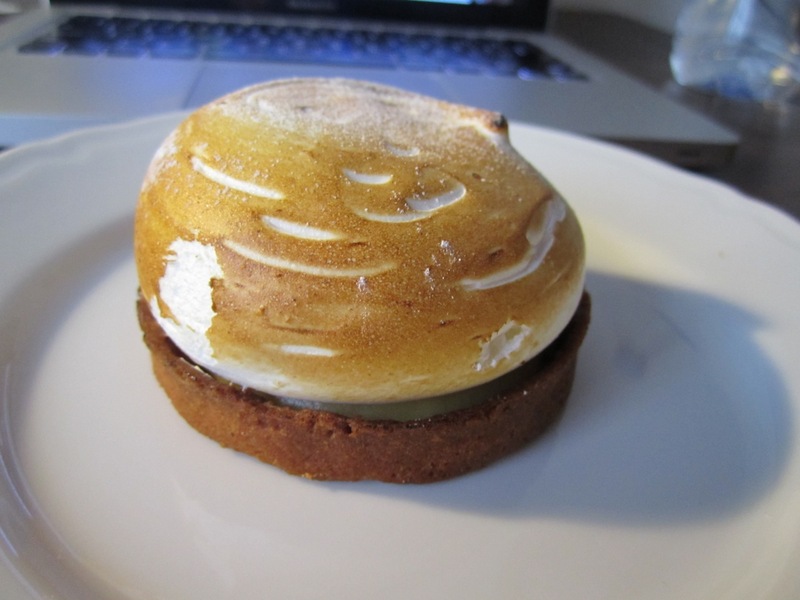 I about fell in a puddle and weeped, but I held myself together as I ordered myself a lemon meringue tart. It was packaged up, and with a heavy heart I went back into the drizzle on Rue Saint-Paul. The raindrops mingled with a little tear that rolled down my cheek as I made my way up the street. It was so sad to me that every day this scene would play itself over and over again, but I would no longer be a part of it. Paris is truly the only city I could ever live in happily, I think, it’s as much home to me as my own home is. After dinner, Jessica and I loaded up on wine. 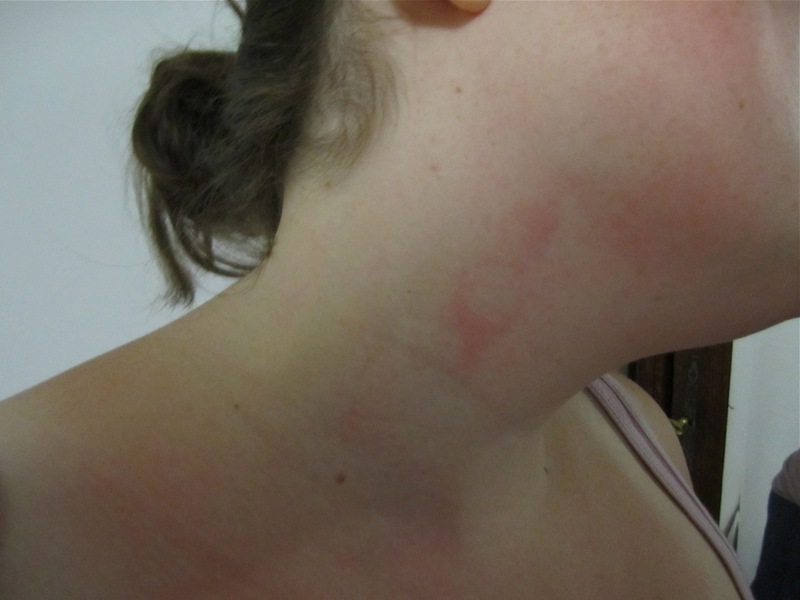 She took a sip that contained maybe a teaspoon before gagging and claiming that her stomach was boiling. She’s a heavy drinker. I had a glass, then took a few swigs out of the bottle to look badass. Jessica tried to read a message I received on my iPod, so I attacked her with the cork that I didn’t realize I was holding. I got her right in the jugular. I’m a natural assassin. I had my tart later that night, which was absolutely delicious and made me want to start crying all over again. Then I went to bed. We had to get up at some ungodly hour, so I cuddled up with my iPad and finally drifted off.